Offered in a convenient set of two, these swivel counter stools boast intricate openwork backs and curving legs that give it an elegant touch. These hammered swivel counter stools will add a classy, artistic touch to your kitchen or dining room. Each stool in this set comes with a beautifully wrought openwork back design consisting of curves and circles and delicately curving legs. A brown faux leather cushion is placed onto the seat for a handsome effect. Each stool is 37" high x 16" wide x 19 3/4" deep. Weighs 15 lbs. Seating area is 24" high from the floor x 15 3/4" wide. Seat back is 14" high. Set of two swivel counter stools from the 55 Downing Street™ brand. Full 360-degree swivel seats with brown faux leather cushions. Curving metal tube legs. Each stool holds up to 300 lbs. Nice look to suit our kitchen. Right height and price. Like the wrought iron, wood and seat cover look all together. Easy assembly. This design goes with my decor! Yes, it is metal black. how much body weight this chair holds? BEST ANSWER: Hi - each stool holds up to 300 pounds. Do the legs have some type of floor protection to keep from scratching a wood floor? BEST ANSWER: Yes, chairs have small round plastic feet that are about 1 inch diameter. We use the chairs on a tile floor and the feet seem to work fine. You could probably also put small round felt furniture floor protectors over the plastic for additional protection. Great chairs by the way -- look great at our counter. There are plastic caps on each foot. We also put stick on 1" round felt pads purchased from Home depot for a few bucks. No scratches to our wood flooring. And the stools slide much better. 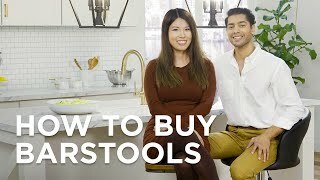 When buying the two counter stools are you able to buy one extra instead of two wextra? BEST ANSWER: I am sorry - these are priced and sold as a set only. Is the metal black or brown? BEST ANSWER: It is a bronze finish with black color undertones. BEST ANSWER: Hi - I am sorry, these are not designed nor rated to be use outdoors. Looking for black metal/med color wood combo bar stool type seats NOT taller than 18 inches high seat to floor...got anything like that ? BEST ANSWER: Unfortunately, we do not have a barstool that measures 18" inches or lower from the floor to the seating area. Would you recommend to use with a 32 in High bar pub table? BEST ANSWER: Generally, we recommend that the seat height of a stool be 10 inches shorter than the height of the counter or bar. The seat height for these stools is 24 inches. The seat will be 8 inches shorter than your pub table. If you are comfortable with an 8 inch difference then I think these would work perfectly! Thanks, I think they will work. Shannon L.
BEST ANSWER: Hi - The recommended weight limit is 300 pounds per stool. We ordered 4 stools. They were fairly easy to assemble. We like the look of the leather, metal, and wood. They are much sturdier than our old wooden stools. we like the swivel counter stools. Packages arrived in a couple of days. Were easy to put together, comfortable, look great. Very happy with our selection. Love the bars stool, they fit perfect in our kitchen. Yes we did have to put them together, but it was an easy process. look great in my kitchen! These are nice, but the "seat" makes you feel like you are slipping off. I think maybe because they are vinyl, where fabric may not feel that way. Not that heavy duty. They'll do for now. Great buy!! Got 4 stools and looks great! Very nice chairs. Easy to assemble. Giid value.